In the “good old days” it was considered OK to pour grey water from washing dishes out on to the ground. Now though most state and national parks and almost all camp grounds and open areas prohibit the dumping of grey water. 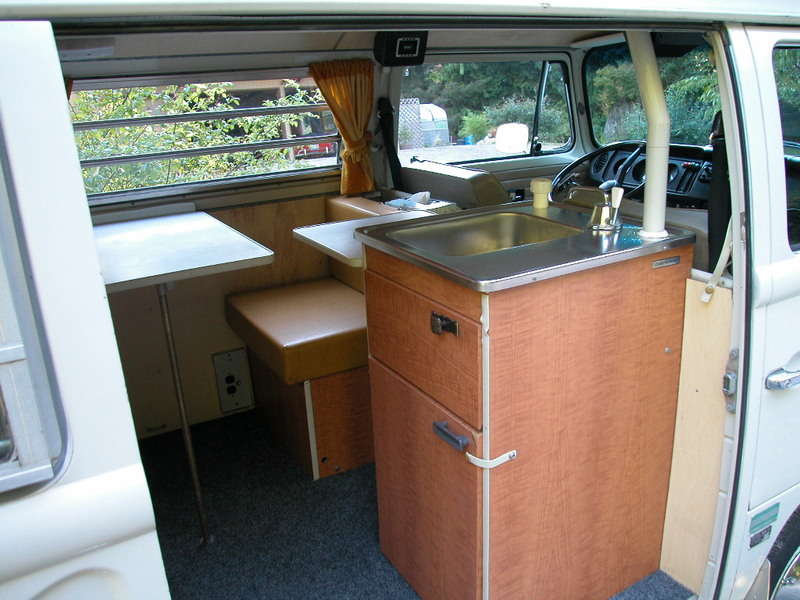 Our 1970 Volkswagen Westfalia camper van sink had a waste pipe that just stopped under the vehicle. Sometimes we’d use a bucket under it, sometimes not. Times change though. Now you need a tank to catch the water from dish- and person-washing. That tank can only be emptied in proper disposal locations. The problem is, if you want to camp in the winter, that tank can freeze up if it is on the outside of the vehicle. You can obviously use antifreeze to stop this from happening, but that costs money and adds chemicals to the water. 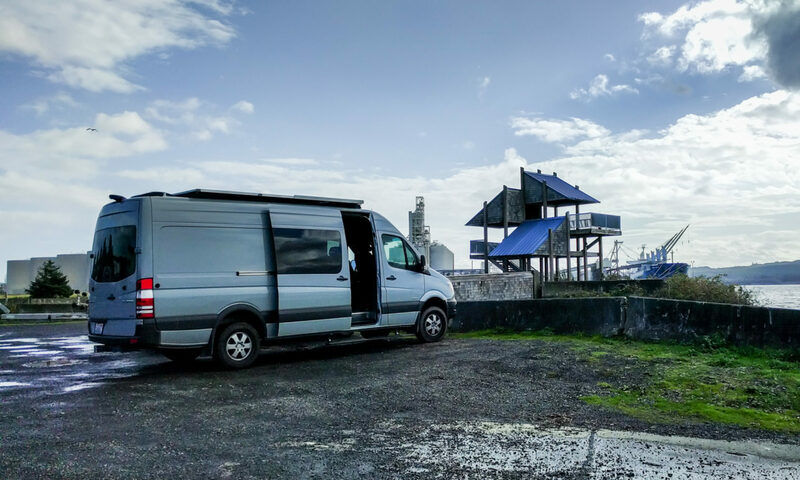 Our solution was to put the waste water tank inside the van. It’s annoying, because that’s really useful storage space for other things, but it does reduce the freeze risk. It also makes it easier to keep the sink cabinet modular and removable. We chose to use two 5 gallon jerry cans because they are easy to lift out and empty. They live under the sink, where they are strapped in place to stop them from rattling around. 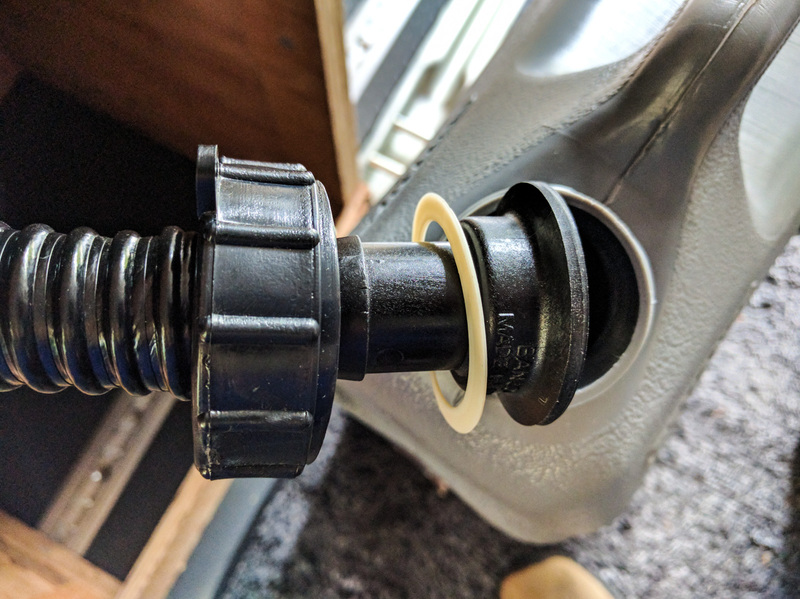 The sink drains directly in to a jerry can via the screw-on lid. When a can gets full, we just unscrew the lid and move it to the other can. The loop in the hose acts as a trap to stop smells from coming back up the drain. We don’t have a vent, but the water doesn’t bubble at all when it pours out of the sink. We had to modify the jerry can lid slightly. It already came with a hole in it because it has a reversible spout. We just changed the spout out for a 1″ fitting with a flanged end. The flanged end was too wide and deep when we bought it, so we had to clamp it in a lathe and turn it down to size a little. If in the future we decide the cans are just too much hassle, it will be pretty simple to change this setup and just add a tank outside the van under the sink area. For now though, it works for us. What kind of hose is that? Looks super flexible.